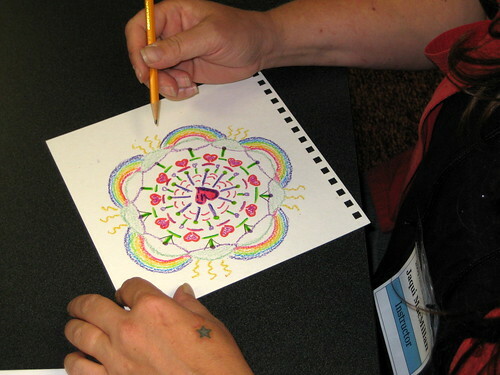 No matter what medium you use, your mandalas are beautiful. I am especially drawn to the flower mandalas, they bring as much peace as beauty to my eyes and soul. The intellectual side of the brain is attracted to your dis-constructed mandalas. They remind me of Dali's work. I love using square note/sketch books for drawing mandalas. I often modify spiral bound ones by marking a line on the cover to make a square and a long rectangle (an 8.5 x 11 makes an 8" sq and a 3" x 8" testing pad) clamping each half and cutting with a box-cutter and clipping the wire with wire-cutters. This way I can use any type paper from the art store. Sometimes I get the glued-edge pads wire bound and then cut them. Love your reviews, as you try out things I would like. Anne-Sophie, Thank you so very much for your kind words. It makes me very happy that you find inspiration through my work. Molly - great idea cutting down your own pads! Tip - use a pair of pliers to fold a little crimp in the wire so it doesn't scratch you. And a big thank you for finding my reviews helpful. Happy Holidays!